The various strains of American Landrace swine are the descendants of the famous Danish Landrace hogs that were developed in Denmark in the 1890s. It resulted from crossing the Large White hog from England with the native swine. Largely through the use of the Landrace Denmark became a great bacon-exporting country. In the early 1930s the United States Department of Agriculture entered into an agreement with the Ministry of Foreign Affairs in Denmark for the purchase of 24 Danish Landrace. This stock was to be used for swine research studies with the stipulation that this breed would not be propagated as a pure breed for commercial use. The foundation stock of the American Landrace were those hogs that were bred pure or that carried a small infusion (one-sixteenth to one-sixty-fourth) of Poland China blood. Thirty eight head of boars and gilts were imported from Norway that carried Norwegian, Danish, and Swedish Landrace blood. Their blood was blended into the American Landrace and helped give a broader genetic base to the breed. For 15 years the Landrace were used in numerous comparisons with American breeds. As a result of this work, four new breeds were registered by the Inbred Livestock Registry Association. The American Landrace has a long body and sixteen or seventeen pairs of ribs. They have a less-pronounced arch of back than most breeds of swine, sometimes almost flat. American Landrace pigs have a long and narrow head with a clean jowl. Their ears are large and heavy and are carried close to their face. They have an admirable meatiness about them on foot and particularly on the rail. Their rumps are long and comparatively level and their hams are plump but trim. Their sides are long, of uniform depth, and well let down in the flank. 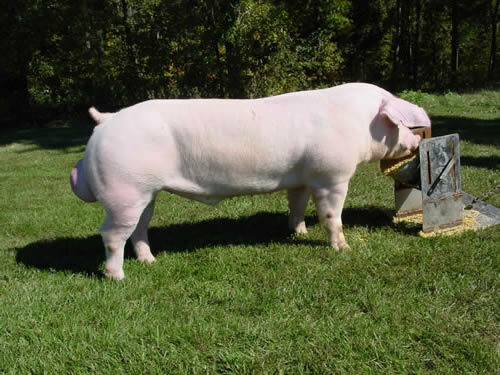 American Landrace pigs must be white and dark, skin spots are considered undesirable. A few freckles on their skin is allowed but black hairs are not. Black Spotted pigs are not eligible for registration. American Landrace sows are prolific and good mothers, and generally have plenty of milk; however, studies have shown that they reach their top milk production after five weeks of lactation which is later than other breeds compared. American Landrace, which are noted for their ability to farrow, cross well with other breed, and raise large litters, are the fifth most recorded breed of swine in the United States.